If you haven’t tried out intermodal freight shipping yet, you’re really missing out. 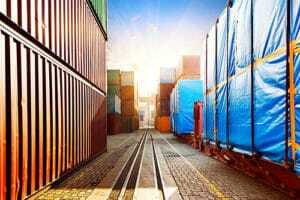 Freight shipping via intermodal has surged in popularity over the past few years, and the growth it’s experienced means more options for the savvy company who wants bigger, better, and more cost effective logistics. At C&D Logistics, we know the importance of intermodal freight shipping and how it can benefit businesses. Here’s how it works – Intermodal transportation uses an intermodal container moved by truck to the rail yard. A truck then arrives to take the shipment to its final destination. Although intermodal is a great fit for many different products and types of freight regardless of size and weight, the best savings you’ll experience are when you ship longer hauls moving 300-500 miles. That’s due to the large savings in fuel costs, and fuel costs are what is causing this type of shipping to surge in popularity. Why has Intermodal transportation experienced such rapid growth? For one, companies on the look out for consistent fuel-savings have taken notice of the rapidly expanding network for rail. Plus, as the demand for rail options has grown, intermodal carriers have began to improve and tailor their service offerings. So how will intermodal transportation work for your company? Fuel costs are rising – You know how the price at the pump never seems to stop increasing? While you can’t really do anything about that, you can choose a mode of transport that will ease your fuel bill at the end of the month. Shipping by rail is by far the most fuel-efficient mode of transportation available in today’s current market. It’s a safe and reliable – When you want your freight there on time and without delay, intermodal is a great choice. In lanes of tight availability, intermodal is the reliable alternative to the truckload market. Rail is always expanding – In Canada and the USA, miles upon miles of rail line are being put into place every day. That means there are increasing destination options and service levels for your intermodal freight. Getting started is simple – C&D Logistics is dedicated to purchasing intermodal capacity at wholesale pricing based off of our volume from the best rail providers available. If you would like to learn more about intermodal shipping from C&D Logistics, please contact us today. In addition to our intermodal freight shipping, we provide international freight shipping, Canadian freight shipping, third-party logistics services and more.